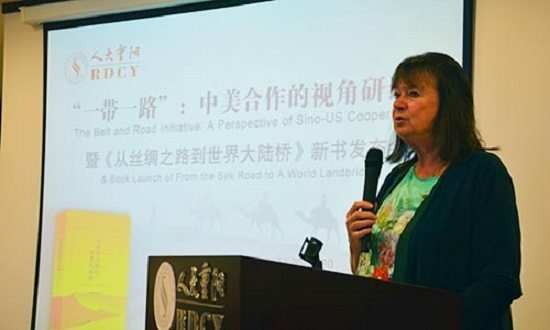 The Chinese edition of the EIR report, “The New Silk Road Becomes the World Land-Bridge” was officially presented by Helga Zepp-LaRouche, the founder of the Schiller Institutes, at a symposium sponsored by the Chongyang Institute for Financial Studies at Renmin University on Sept. 29. The Chongyang Institute is also a co-sponsor of the Chinese-language report. The Chongyang Institute was established a few years ago by graduates of Renmin University, and fashions itself as the new type of think-tank called for recently by President Xi Jinping, who is concerned about receiving the best analysis of the present world situation and some key recommendations for policy as China and the world enter into a new era of international relations. 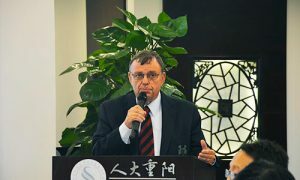 Wang Wen, the Executive Dean of the Chongyang Institute, as well as Mr. Fu Jianming, the Vice President of the Pheonix Publishing & Media Group which published the Chinese version of the report, made introductory comments at the press conference, which drew 70 people, including at least 15 journalists. 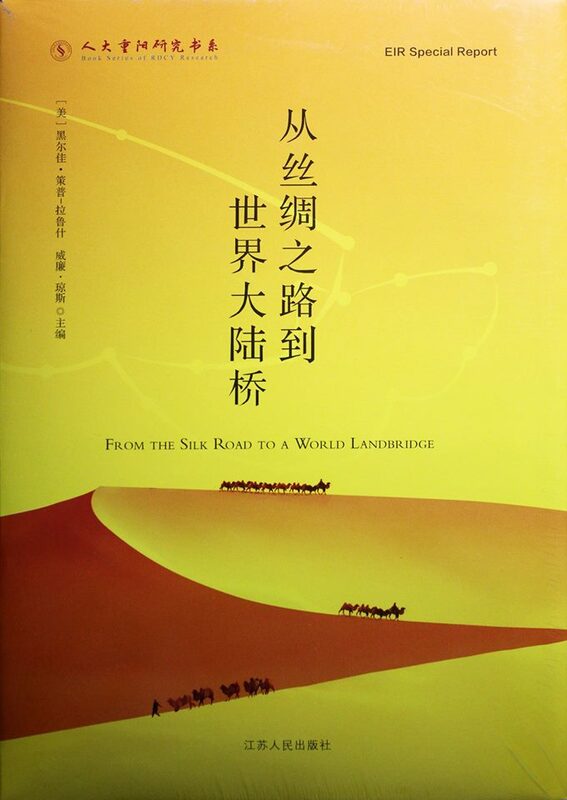 The full 370 page EIR World Land-Bridge report, now in Chinese. She explained how she and her husband, economist and statesman Lyndon LaRouche, had, with the break-up of the Soviet Union, expanded on the series of development programs they had worked on for decades, to elaborate a program for linking the entire Eurasian continent. Schiller Institute founder Helga Zepp-LaRouche in Beijing, September 2015. 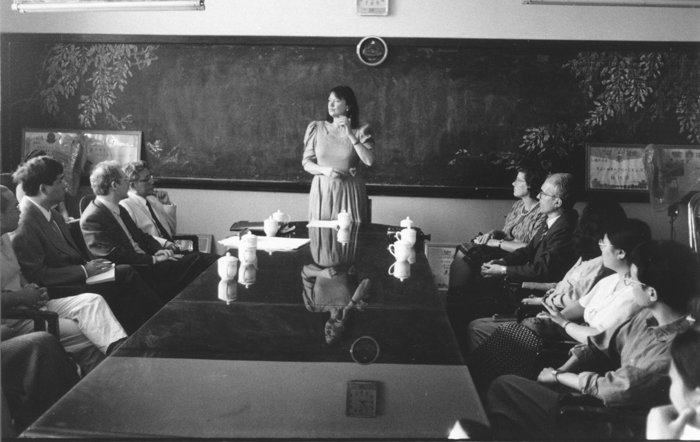 Discussions with representatives of the Chinese government in the early 1990s led to a conference in Beijing organized under the auspices of the Chinese Ministry of Science and Technology in 1996, Mrs. LaRouche explained. This conference with leading experts from China and 34 other Eurasian countries, included an address by Mrs. LaRouche devoted to the implementation of this project. 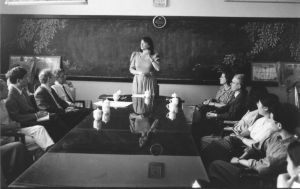 Helga Zepp-LaRouche speaking at a 1996 international symposium in China on the New Eurasian Landbridge. The Asian financial crisis of 1997 and the ruble crisis of 1998 prevented the further movement of this project. And it was only in September 2013 that Chinese President Xi Jinping revived the notion in his famous speech at Nazarbayev University in Kazakhstan, calling for the creation of a Silk Road Economic Belt to unite Europe and Asia. She then went into the crisis in the Middle East and the massive flow of refugees into Europe from the war-torn areas created by U.S. policy under Bush and Obama. There is a very recent recognition by many European nations, that there must be a change in policy and the root causes of the refugee crisis must be adressed, she said. It is not enough to fight the Islamic extremists militarily; there must also be a real economic reconstruction of the entire region, which is now completely destroyed by war, to create a future for the young people now being attracted to violent jihad. EIR‘s Washington Bureau Chief Bill Jones then outlined the tremendous possibilities opened for the world, including the United States, with the implementation of the Silk Road project. He noted how Lyndon LaRouche, in 1975, proposed the creation of an International Development Bank for financing the development of the Third World, and how the Foreign Minister of Guyana Fred Wills, had, in collaboration with LaRouche, issued at the UN General Assembly in 1976 a call for a New World Economic Order and a debt moratorium for the developing nations. “But there would be no new world economic order nor any debt moratorium,” Jones said. And the world then entered into a new phase of inflationary expansion of the world financial system which now encompasses over $2 quadrillion of accumulated—and unpayable—debt. “President Xi’s project of a land and maritime Silk Road Initiative offers now the possibility of reversing that dangerous trajectory,” Jones said. EIR’s Bill Jones speaking in Beijing, September 2015. Jones also noted that, while the U.S. Administration has been less than enthusiastic about the project, there was a growing understanding in the United States, particularly at the state and local levels, which are greatly suffering the effects of the financial crisis, as well as among industrial layers, that what China is doing—and is offering the world—represents a ray of hope in an otherwise disastrous economic situation. These two presentations were followed by comments from eight leading Chinese scholars, who had read the report. Their reaction to the report was absolutely electric. Professor Bao Shixiu, formerly a Professor of Military Strategy at the PLA Academy of Military Sciences, said that bringing together the countries of the region around the New Silk Road initiative in a process of regional development was the task of the day. This was also the idea behind the notion of the Eurasian Land-Bridge put forward by the Schiller Institute in the 1990s, he said. Ding Yifan, the former deputy director of the World Development Institute of the Development Research Center of the State Council of the P.R.C., underlined the importance of the economic concepts of Lyndon LaRouche, laying at the basis of the report. “I have known the Schiller Institute for a long time,” he said, “and I have learned much from them. They have very specific ideas about the world economy. The concept underlying LaRouche’s view of the economy is that of the physical economy. LaRouche used the term negentropy to characterize the underlying laws of a healthy functioning economy,” Ding Yifan said. Shi Ze from the China Institute of International Studies explained how the problem in the world today is caused by geopolitical thinking. Tao Qingmei of the Beijing Long Way Foundation noted that the report also mooted the question of a new order and a new relationship between nations. “Today we have to proceed from a regional perspective, one which involves economics, politics, and culture. China is learning from other countries. And this book is very important in that respect,” he said. Zhang Jianping, the Director of the Department of International Economic Cooperation at the National Development and Reform Commission, underlined the collaborative nature of the Silk Road Initiative and its openness to all countries. While noting skepticism from the U.S. side about the Silk Road project, he saw a certain shift in policy with regard to the U.S. view of the AIIB. Europe, on the other hand, was becoming absolutely enthusiastic about the project. Zhang felt that the EIR report, which he also noted was the result of 20 years’ labor, was an important element in promoting the idea of the New Silk Road in the United States. Zhao Changhui from the China Export-Import Bank praised Progress Publishing for bringing out this report. He called the Silk Road project a thousand-year initiative. “When reading the report we have to ask ourselves how we can make a difference. It leads us to reflect on our own obligations.” He said that scholars must develop a long-term vision, as it was reflected in the report. Liu Ying, the Director of the Department of Cooperative Research at Chongyang Institute, noted that the report was written from a global perspective, but from a modern global perspective, including from a space perspective. “This report is about predicting the future rather than just explaining the past,” Liu Ying said. All the participants received a copy of the Chinese report. The Chongyang Institute had purchased 1000 copies which they will distribute free of charge to a wide section of the Chinese political and intellectual circles. There was a considerable amount of coverage of the press conference in the economic press stressing the fact that this was the first analysis by “American scholars” of the Chinese project. There was also widespread recognition in the media reports of the role of Mrs. LaRouche and the Schiller Institute as a key initiator of this project in the early 1990s. The high-level participation in the event by eight Chinese scholars, and the sponsorship by the prestigious Chongyang Institute for Financial Studies, underlined the fact that the EIRreport has now become an authoritative source for Chinese scholars in pursuing the “One Belt, One Road” project. The economic concepts championed by Lyndon LaRouche over the period of 50-plus years have now become a staple for the intellectual layers in this, the most populous country in the world.